Tired of sweating through the day or shivering through the night? Take control of your home with Country Comfort Solutions. We'll troubleshoot your HVAC system so you can make sure that your air conditioning is working in time for summer and your heating is working in time for winter. We are authorized dealers of Bryant air conditioning and heating units. You can get new installations through us as well as repairs, replacements and maintenance. Call 618-763-4600 today to discuss options for your HVAC system. Fortunately for you, we take care of both repairs and replacements on HVAC units. You can count on us for any updates or changes you're looking for. Contact us now to determine if your HVAC unit needs to be replaced. 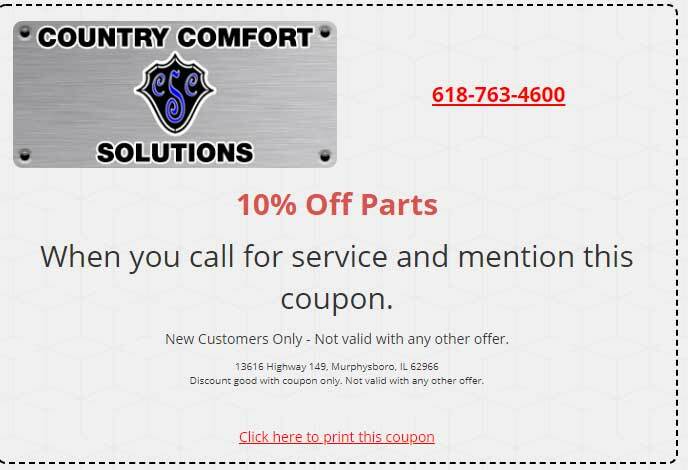 Why should you choose Country Comfort Solutions? When we started this company almost 10 years ago, we founded it on the belief that all families deserve cozy warmth and refreshing air conditioning when they need it. As a local, family-owned company, we know how important it is to you to keep your family safe and comfortable. The family-oriented Christian values we have always held close are still important to us today. We are proud to offer service in and around the following areas: Murphysboro, Carbondale, Ava, Gorham, Jacob, De Soto and Grand Tower, IL. Call now to start enjoying comfort and warmth throughout your house.